Once in a while here at the bunker an assignment comes through the SatCom that makes for a curious afternoon. I was to cover an event called the Beer Mile, and as I waded into the literature and the footage, I became more and more intrigued by this sporting mutation. It looked more like an impromptu frat house initiation than it did a sport. 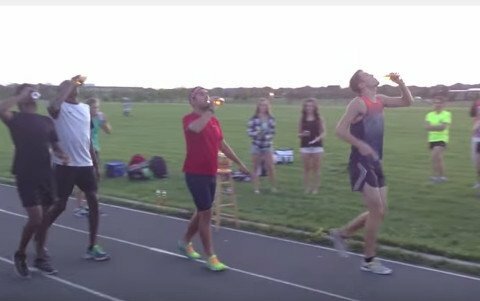 The Beer Mile is part drinking game, part track and field event. The object is to slam a beer and then sprint a quarter mile, and then repeat those steps three more times, essentially. And vomiting is grounds for disqualification. The official rules, however, come with variations. In one such iteration, competitors are permitted to vomit while drinking pints before each quarter mile. Another includes a vomit as the start of a fifth quarter mile run. There are many other variations, as explained here. The record for a standard beer mile were shattered recently by two gentlemen in less than 24 hours. On August 7, Australian Josh Harris, 25, posted a Youtube video of himself finishing a beer mile in 4:56.2. His time beat out James Nielson, who in April 2014 became the first beer mile competitor to break five minutes. “New beer mile world record, baby,” a smiling Harris says to the camera. But even Harris’ record would not stand long, as Lewis Kent, age 21, posted a 4:55.78 time on Youtube just 24 hours later. The use of what could be understood as performance enhancing or performance detracting substances in a competitive race has in this instance blurred a meta line and taken both activities to new and strenuous levels. I began to respect these athletes for their willingness to encumber themselves and then compete in a sprinting race. So much so that I let my neighbor Gary know of the race and my admiration for the competitors. As luck would have it, Gary happened to have a six of Olympia Tall Boys in his shop, and the sun was out. Needless to say we decided to give it a shot. Ours became a beer half mile, or at least we decided the lap around our block would do, as long as we downed an OLY before each lap. What I can report is that running a lap around any distance and then repeating is tricky enough, but to introduce cheap beer is similar I imagine to running up hill while spinning with a view master viewer strapped to your forehead. The exponential level of fatigue and alcohol-induced vertigo in unrivalled. Gary was able to complete his laps without incident, while I found myself clinging to a neighbor’s pear tree, trying desperately not to pass out. My admiration goes out to the fine athletes who compete in the Beer Mile. With a record time of 4 minutes, fifty-seven seconds, there is some real skill and championship running in the Beer Mile arena. Do you have what it takes? Try your luck at the Beer Mile World Championships to be held Aug 22 in San Francisco.